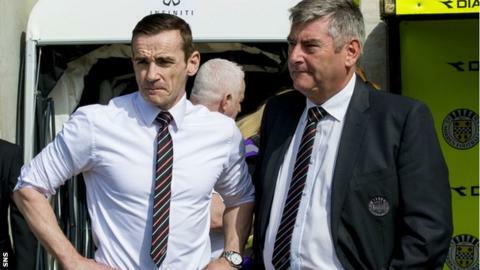 St Mirren manager Danny Lennon insists he has "held up his end of the bargain" ahead of a board meeting over his future. Lennon, who guided the Buddies to Premiership safety this season, is out of contract in the summer. Afetr meeting on Thursday, the club's board will re-convene to assess the situation again next week. "When I was brought in, my remit was to make sure the club remained in the top flight," Lennon said. "And I'm delighted that, for the ninth season in a row, the club has achieved that. I thank the board for helping me do that and I've held up my end of the bargain," Lennon added. "Two years ago, I gave them their highest finish in the SPL at the time and we won a national cup [the League Cup in 2013]. "The manager at any club carries the can for results and I think, as a whole, we've achieved more than the expectation was. "I think it's pleasing in this day and age that a manager can see his contract out and I've got to thank my board of directors for that. "I'm my own biggest critic and I've made mistakes at St Mirren, but I've learned from them and, from when I came in the door four years ago, I'm certainly a better manager for it today." Lennon, who was speaking after his side lost 1-0 to Kilmarnock, said he was not not worried about his future and, when asked if he knew about the board meeting, he replied, "No, we'll just concentrate, regroup and we'll be back in tomorrow morning, recovering and looking to go again on Saturday." Earlier, chairman Gilmour praised Lennon's side's recent displays that secured safety and said no decision had been made on the manager's future. "It is a huge decision. It's a decision about how we take St Mirren Football club forward. Danny has got a lot of positives in there," he told BBC Scotland. "We've got to look at the whole picture. That's what the guys will do tomorrow and we'll take it from there. "Danny has done particularly well in the last period, there's no question of that. The team have done incredibly well. "We always thought we had the ability there to be clear of the relegation play offs - and I know the players' professional pride makes them want to be seventh [in the table]." "As it so happens, the board are meeting tomorrow and we'll have a full discussion of a number of things of which the manager's position will be a main focal point. "We're a very argumentative, talkative board and I am sure plenty will be said and we'll be talking to Danny within the next couple of days."